The terrorist attack in 2008 on the Chabad House in Mumbai, the Jewish educational center and synagogue, transformed Siona Benjamin's art and life in major ways. 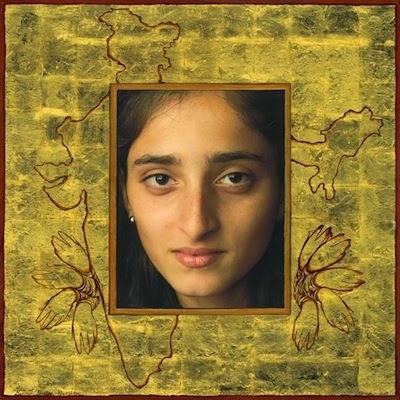 She was born in Mumbai, a member of the Jewish Bene Israel group that settled there over 2000 years ago, and brought up in a predominately Hindu and Muslim India. Presently, she is a United States citizen and artist. In her paintings, Benjamin combines the imagery of her past with the role she plays in America today, making a mosaic inspired by Indian miniature paintings, Sephardic icons, and often pop art. She has exhibited in the United States, Europe, and Asia; received an Artist Fellowship from the New Jersey State Council on the Arts in 2004; and a Fulbright Fellowship in 2011. She was disheartened by the lack of media coverage of the event in which six of the occupants in the Chabad House, including the Rabbi and his wife, were killed. With the help of the Fulbright Fellowship, Benjamin returned to India several times and with great determination explored and captured the various remaining Indian Jewish faces and stories of the Bene Israel group. These are the works that make up this exhibition. Several were shown in the fall of 2013 at the Chhatrapati Shivaji Maharaj Vastu Sangrahalaya (Prince of Wales Museum) in Mumbai. Her goal is to raise awareness of the long standing history of this community to which she has such an allegiance. Benjamin uses photography and painting to share the individual stories and remarkable heritage of the ancient group, before their existence becomes an Indian cultural relic. According to Benjamin, "Visualizing the Bene Israel faces and then painting ornamentation that represents their lives and passions," has been a very personal experience. "I wonder if they could be the ghost images from my past and childhood. I am weaving new and old stories. Are these faces from dreams and memories or are they just other faces from passports, immigration cards or perhaps from my parents' photo albums? It is with these faces and stories that the rest of the world, I hope, will come to know more about the Bene Israel Jews in a very transnational India."